This course explores the purpose and foundations of evangelization and catechesis and the practical processes of the presentation and proclamation of the Faith. Included are a study of human development, natural, moral and spiritual; a survey of evangelization and catechetical methods available for various age groups, levels of spiritual development, and situations; including methods and models for parish evangelization programs, RCIA, sacramental preparation, Bible studies, adult education, retreats, etc. Also included are religious education models, effective public speaking, and use of social media in evangelization. A survey of the history of the Church from its Apostolic origins through the Middle Ages, with special emphasis on theological issues and the contributions of the Church to culture and civilization. Includes the development of the early Church, major councils of the Church, the Monastic tradition, the Eastern Schism, the rise of Islam, and the Crusades. A study of Thomas Aquinas’s metaphysics and philosophy of man, based on the Summa Theologiae, including the proofs of the existence of God; the relations between essence and esse in creatures and in God; the attributes of God; human nature; man’s knowledge, emotions and will; the spirituality, subsistence and immortality of the human soul; the union of soul and body, and man as a person. This course accentuates God’s revelation both in creation and to the Patriarchs and Moses. It reviews the creation accounts in Genesis in light of God the Creator, man’s creation in the image and likeness of God, and marriage. It examines the Fall and the biblical notion of sin, and presents an introduction to the Pentateuch and its biblical theology. An introduction to the doctrine of God, the Triune Creator, especially from the theological perspective of St. Thomas Aquinas. The course includes the existence of God and the divine attributes; our ability to know and speak about God; God’s knowledge, will, creative action and providence; the patristic development of Trinitarian dogma; the processions and personal relations within the Godhead; the divine persons considered with respect to the one divine essence and to each other; and the external divine missions. This course combines historical and systematic methods in a sustained engagement with primary sources, especially Aquinas’ Summa Theologiae I. Moral and canonical issues related to procreation and the care of human life, including fornication, homosexual acts, contraception, sterilization, natural family planning, the prophylactic use of condoms, artificial insemination, in vitro fertilization, cloning, embryo adoption/rescue, abortion/craniotomy, ectopic pregnancies, organ transplantation, “permanent vegetative states,” end-of-life issues, euthanasia, brain death, and the mission and identity of Catholic health care institutions. A full-immersion introduction to ancient Greek, the course will familiarize students with the language through natural learning methods. From the first day, all lessons are conducted in ancient Greek using techniques based on the way in which children acquire their mother tongue, allowing the students to develop a keen intuition in understanding and speaking the language. Two levels are planned: one for absolute beginners and one for those with prior experience reading ancient Greek. The program includes 90 hours of full immersion classes and activities and corresponds to a semester (3 credits) of ancient Greek. The second half of an introduction to ancient Greek, the course focuses on the vocabulary, forms, and syntax of Attic Greek. It is the equivalent of the second semester of elementary ancient Greek. Upon its completion, students will be equipped to read biblical, classical, and patristic authors with a dictionary. The course will also offer opportunities for active (i.e. spoken) Greek, including both in-class exercises and a regular Greek lunch table. Must be taken for credit, not audited. The credits earned do not count towards the Master of Arts degree. An introductory course aimed at a reading knowledge of Latin as used in classical, biblical, and patristic sources—the course focuses on the vocabulary, forms, and syntax of the Latin language. It is the equivalent of an entire year of elementary Latin. Students will be equipped to read biblical, classical, and patristic authors by its conclusion. The course will also offer opportunities for active (i.e. spoken) Latin, including both in-class exercises and a regular Latin lunch table. Must be taken for credit, not audited. The credits earned do not count towards the Master of Arts degree. Fr. Brian Mullady will present an indepth examination of the Theology of the Body of Pope St. John Paul II. The course will include its relation to the thought of St. Thomas Aquinas and the Scholastic tradition. Also included will be the relation of the Pope’s teaching to the living of the vow of chastity in religious life. 2 credits. A close examination of the various canons of the Code concerning the consecrated life, intended to give a general juridical understanding of the consecrated life, as a basis for understanding and interpreting the proper laws of various institutes. 2 credits. Taking an integrative approach to psychology, Catholic spirituality, the moral life, and anthropology, this course will explore avenues of psychological growth and healing that can resolve natural impediments to moral and spiritual flourishing, especially for persons committed to celibacy or virginity, and to community life. Topics covered will include identification of issues in candidate evaluation and challenges that are often missed during formation, matters of stress, forgiveness, emotional healing, psychological maturity, the cultivation of healthy relationships, burnout, anger, attachment issues, unhealthy coping strategies, as well as the connections and distinctions between an individual’s psychological, moral and spiritual growth. 2 credits. The liturgy as the source and summit of the consecrated life, with examination of various liturgical texts and magisterial documents on the liturgy. 2 credits. This course studies the ascetical life of penance and self-denial and the necessary role it plays in the Christian life of virtue and prayer. It takes as its primary framework the teaching of St. John of the Cross on the purifications the soul must experience to reach Christian perfection. Within that context the ascetical practices of fasting and vigils, custody of the senses and the disciplining of the passions, and the mortification of the intellect, memory, and will are explained. Lastly, the course looks at the passive dark nights the soul must endure to reach union with God, and the power of redemptive suffering. 2 credits. In this Culture of Death and our consequently impoverished educational system, few are formed to think rationally even about the most imperative and fundamental philosophical questions. This course serves as a remedy for the intellectual formation lacking in many religious. It is an introduction to the philosophical thought of St. Thomas Aquinas and will cover major themes that figure prominently both in Philosophy and Theology: e.g. faith and reason, the four causes, evolution, God’s existence, man as composite of body and soul, immortality, happiness, virtue, natural law, and friendship. This course will not only help purify the intellect of many errors prevalent in our culture, but also help us to understand better the Christian mysteries we celebrate and live every day as religious. 2 credits. The course reflects on the meaning and content of the gospel genre in the New Testament. It highlights the relationship between the Synoptic Gospels and the Johannine Gospel. It also provides an in-depth study of Ss. Matthew, Mark, and Luke, as well as the Acts of the Apostles. Special emphasis is given to the Infancy Narratives, the Lord’s Supper, and his passion, death and glorious resurrection. A survey of the historical, wisdom, and prophetical books of the Old Testament as a preparation for the New Testament era. Includes the revelatory stages of salvation history, the importance of Biblical typology, and the function of fulfilled prophecy. A study of John’s gospel and epistles, the Book of Revelation and the Catholic epistles, emphasizing the influence of the Old Testament on this literature as well as the historical setting of composition, especially in regard to the heresies of the Judaizers and gnostics, and the persecutions of Christianity under the Roman empire in the latter half of the first century. This emphasis in study transports the modern reader back into the world of the early Church, making these books, along with the rest of the New Testament, come alive today in the modern world. This introduction to the graduate-level study of theology treats comprehensively the meaning of theology, its various disciplines, major methods and basic terminology. Areas of focus are Divine Revelation and the characteristics of the human response, relationships between faith and reason, Scripture and Tradition, doctrine and its development, and the roles of the Magisterium and the theologian in the Church. Special attention is also given to the history of theology, with particular emphasis on the patristic, medieval, and post-Vatican II periods. Prerequisite for all M.A. and Diploma students unless exempt because of prior theological study. The credits for this 500-level course do not count toward the graduate-level theology credits required for the MA degree. A study of the Person of the Holy Spirit, both within the Trinity and within the mystery of the Church, as expressed in Scripture and Tradition. Magisterial documents such as Mystici Corporis Christi, Suprema haec sacra, and Lumen Gentium receive particular attention. Also studied in detail are the properties and marks of the Church, the privileged role of the Mother of God in the Church, and the universal call to holiness. The reasonable explanation and defense of the Catholic Faith utilizing Scripture, theology, Church history, and philosophy to explain Catholic beliefs and practices, such as Tradition, the Papacy, justification, the divinity of Christ, miracles, the problem of evil, the Real Presence, the Blessed Virgin Mary, and Catholic moral teachings. 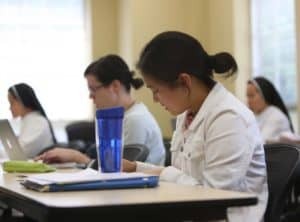 The course especially focuses on controversial points of Catholic doctrine and their rationale, those teachings which are most often misunderstood by Catholics and non-Catholics alike. A study of the Eastern and Western Fathers of the Church, with emphasis on their contributions to Church doctrine, morals and the spiritual life, including their historical context and the significance of their lives and writings for the contemporary Church. No registrations will be accepted without the appropriate registration fee. All credit card payments are subjected to a 3% convenience fee.